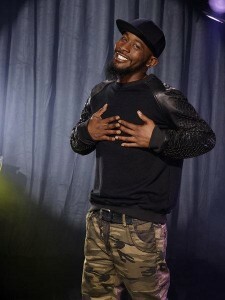 Karlous Miller is a comedian who was one of the top 10 finalists in Season 8 of NBC’s “Last Comic Standing” reality competition series. His appearances on Nick Cannon’s WILD n OUT are legendary and tweeted about regularly. Mississippi native Karlous Miller grew up with a large blended family, including eight siblings, who all became a major influence in his edgy and boisterous comedy style. After working briefly as a firefighter in Oxford, he moved to Atlanta in 2005 to pursue a career as a stand-up comedian. He’s been making audiences laugh ever since. His first television appearence was on Robert Townsends: Partners in Crime-The New Generation. He also landed a slot cracking snaps on MTV’s “YO MOMMA.” Karlous was also featured on season two of Bill Bellamy’s “Who’s Got Jokes?” In 2008, Karlous was selected to play various roles as a cast member on season two of BET’s prank dating show “Hell Date.” He was also been featured on V-103’s Frank and Wanda morning television/radio show and Atlanta’s HOT 107.9. He also laughed it up with Monique on the set of her talk show. Currently based out of Atlanta, Karlous has performed in London,Germany, St.Thomas,Virgin Islands, and Puerto Rico, and various colleges throughout the United States. Karlous has worked with various headlining comedians like Katt Williams,Daniel Tosh (Comedy Central’s Tosh.O), Doug Benson(VH1 Best Week Ever), and various others. He has also worked with musicians like Case, Guccie Mane, Dem Franchise Boyz,Grandaddy Souf,Big Oomp (Records), Jermaine Dupri(SoSo Def), and T.I’s Grand Hustle Comedy.